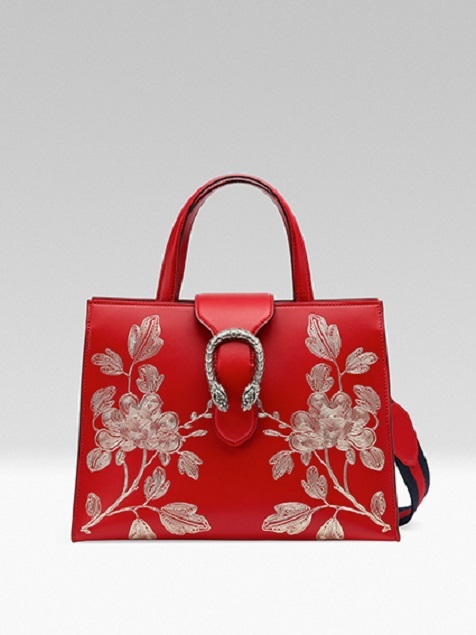 Gucci unveils its Chinese New Year collection to celebrate the year of the rooster. The rooster occupies the tenth position in the Chinese zodiac, which has a 12-year cycle. Each year has a different animal allocated to it. Those born in the year of the rooster are said to be observant, honest, loyal, courageous and talented and Gucci celebrates Chinese New Year with a special collection inspired by this characterful animal. The use of an animal motif is of course in keeping with Creative Director Alessandro Michele’s interest in the natural world and the way in which the House has increasingly been adopting flora and fauna as the subject of prints and decorative design details. 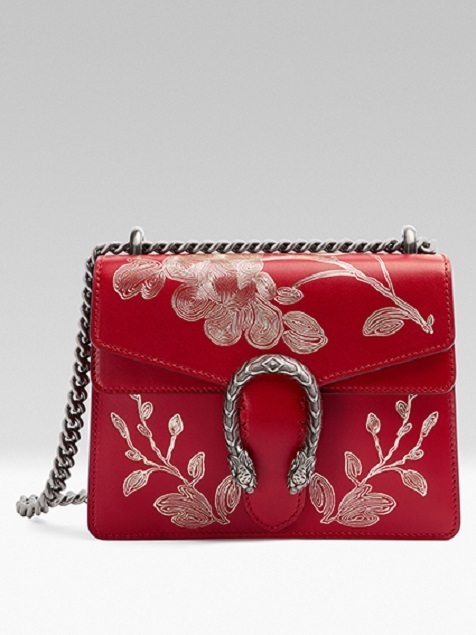 The bags and small leather goods will be available globally, however there will also be a mini Dionysus bag in a similar ‘Ramage’ style that will be made available exclusively for the Asian markets: China, Hong Kong, Macau and Taiwan. 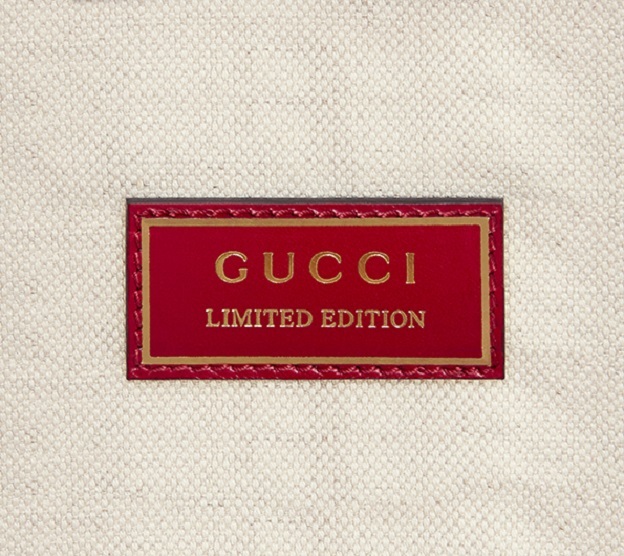 Inside these special bags a label will read: ‘Gucci Limited Edition’. The Chinese New Year collection features bags, small leather goods, a key ring charm, a new version of the Ace sneaker, two silk scarves and a silk headband. Heading the new products are two fresh versions of the iconic Dionysus handbag – a medium shoulder-bag style and a tote. Both display a gold ‘Ramage’ print on a red calf leather background. The print is floral in character and is similar in style to the embroidery seen in the Gucci winter 2016 women’s ready-to-wear collection. It is applied using an engraving and laminating process. A zip-around wallet and a card case with an inside zip-up compartment are available with the same gold ‘Ramage’ decoration on red calf leather to match these handbags. A brass key ring in the form of a rooster has a golden metallic finish. It functions as a personal charm, heralding good news and fortune. The rooster has smoky Swarovski crystals on the tail, a ruby crystal for an eye and a Gucci-logoed pearl on the body. The rooster also features on a new special Chinese New Year version of the Ace sneaker, Gucci’s most successful sports shoe model. The bird appears on a patch on the House green-red-green Web stripe on the outsides of the shoes. The sneakers are in white leather with metallic leather trim on the backs in different colours for the left and the right shoes: metallic red ayers skin on the left shoe and metallic green ayers skin on the right one.